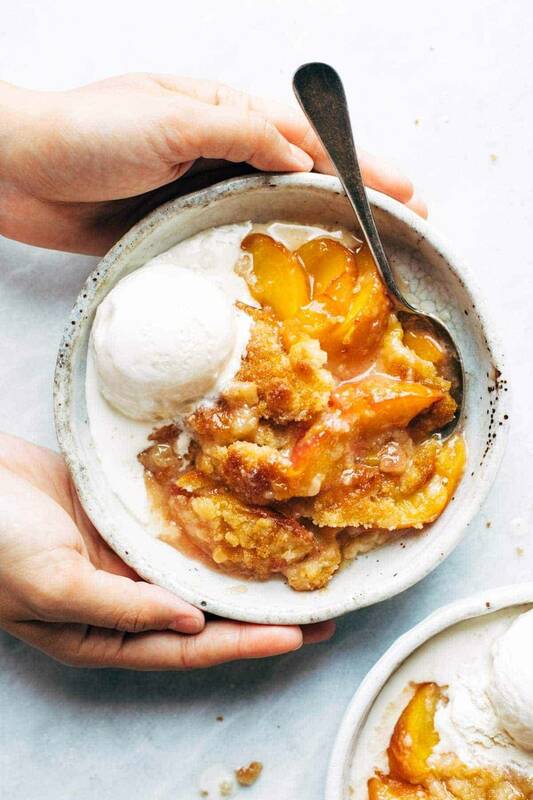 I don’t want to brag here, but I do want to encourage you to get a peach cobbler up in your life. It’s AUGUST, for crying out loud. Live your life. 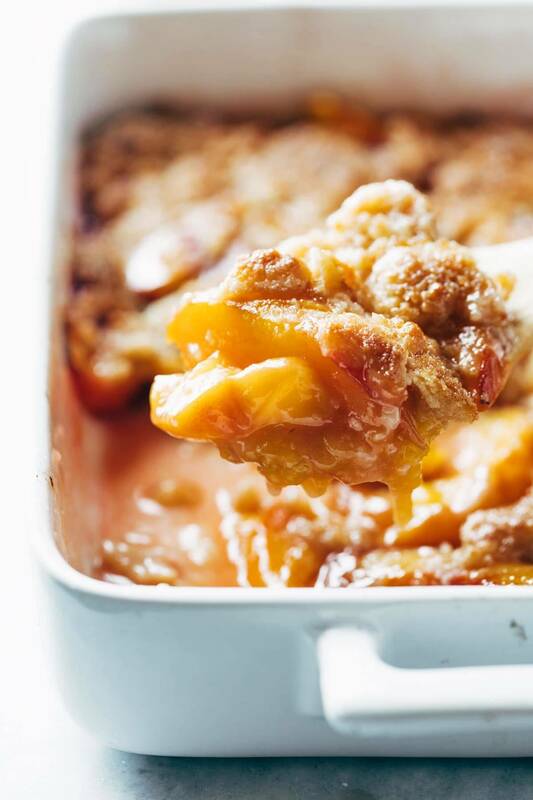 I have tried so many peach cobbler recipes and this is by far my favorite! Best summer dessert ever! Made with fresh peaches, sugar, and a topping that bakes like slightly underbaked cookie dough, with crunchy sugar broiled on top. Preheat the oven to 350 degrees. Smear the bottom of 9×13 pan with a little bit of butter. Add peaches and sugar, and mix directly in the pan. Mix the butter, sugar, vanilla, flour, baking powder, and salt until a cookie-dough-like batter forms. Place scoops of the mixture over the top of the peaches. Spread with a spoon or with your fingers – no need for perfection here. Bake for 25 minutes. At this point it should be juicy and bubbly around the sides – if not, see notes. Sprinkle the top with turbinado sugar. Bake another 10 minutes and then finish with a few minutes under the broiler (475-ish) for a few minutes to get it golden brown and slightly crunchy on top. If it’s not saucy and bubbling after 25 minutes of baking, it’s probably because your peaches are a tad on the firm / dry side. I found that pouring two tablespoons of melted butter over the peaches at this point was helpful in coaxing some “juiciness” out of the peaches during that last chunk of bake time. I did not peel the peaches because I cannot be bothered to peel a perfectly good peach. But if the texture or color of the peels bothers you, you can peel them. I have made this with frozen peaches and it was great. It’s less jammy, since the frozen peaches tend to be firmer and hold their shape a little more, but it’s pretty ideal when you don’t have access to fresh, ripe peaches. 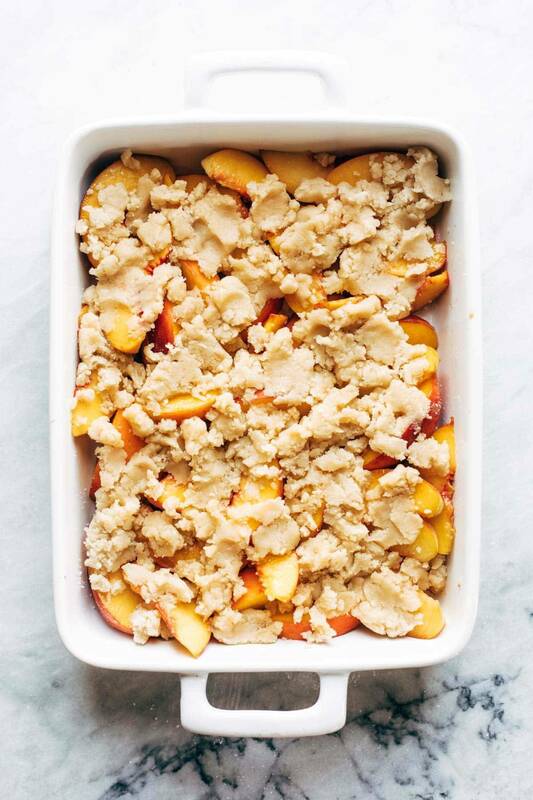 Just dump the frozen peaches in the baking dish and pop them in the oven while you mix up your topping. Once you’re done mixing the topping, the peaches should be thawed out. Drain them off, return to pan, and mix with sugar, and you’re in business. When slicing the peaches, I prefer to slice them pretty thinly so they lay on top of each other more evenly and get that nice thick, jammy consistency. Thank you to Land O’Lakes for sponsoring this recipe! Good god. 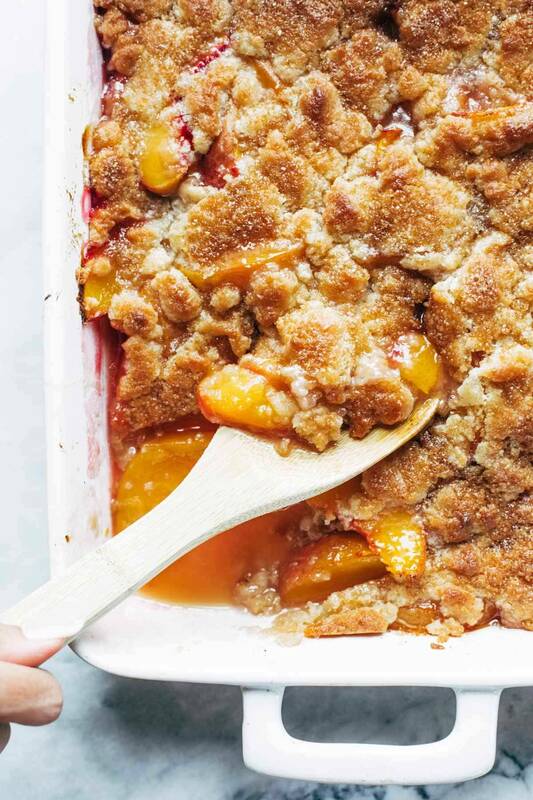 I am def making peach cobbler this weekend. I mean 100% making it. I was already adding to my grocery list before finishing the post. Gotta have it. Awesome recipe! Danielle, Please don’t ruin your beautiful spirit by taking the Lord’s name in vain. He loves you , don’t curse Him. By saying good before God is cursing him? Since when. Since I was old enough to understand the basic love.of Him and keeping his name sacred. Anita, apparently you aren’t from the south. “Good God” is the start of many southern sayings. Be blessed! I am from the south and have never had to reduce Gods name for a saying. I’m a Yankee that has grown up I the south (literally-sinxe I was about 6). I’m absolutely opposed to taking the Lord’s name in vain, but have always believed the expression ‘Good God’, when said about something that brings you (or others) Joy or happiness or blessings is actually just acknowledging and praising Him! I made this recipe, and believe the expression totally fits here! It was wonderful! I take the time to thank Him for all things good in my life, and… Good God, I’m glad I found this recipe! Thanks for posting it! YUM!! This looks incredible! Obsessed with those cute bowls too – btw – where did you find them? I’m wondering the same thing! Those BOWLS! 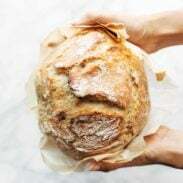 Hi, I just want to say how much I love your writing style, I adore reading your monthly updates and your recipes. The photography is fabulous and I just want to go and make that peach crumble (as I live in France we don’t call it crisp or cobbler) now, it is too hot for the oven though unfortunately. Good work. I can see this being a good recipe to make with my almost four year old. We are loving peach season. Thank you! Perfect timing, I’ll be making this for a dinner party next week! Could you potentially make this with canned peaches as well? I make so many of your recipes and love them. 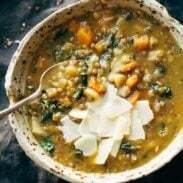 I enjoy when you use DeLallo ingredients as I use to live in Greensburg and when we go back home, we always stop at the store in Jeannette, PA…but, I LOVE YOUR BOWLS…where can I purchase some? Oh yay, this is definitely my kind of summer treat. Sweet peaches, vanilla ice cream and cookie dough. I am officially in love 🙂 Thanks for sharing. I am all about easy, fruit-filled desserts!! 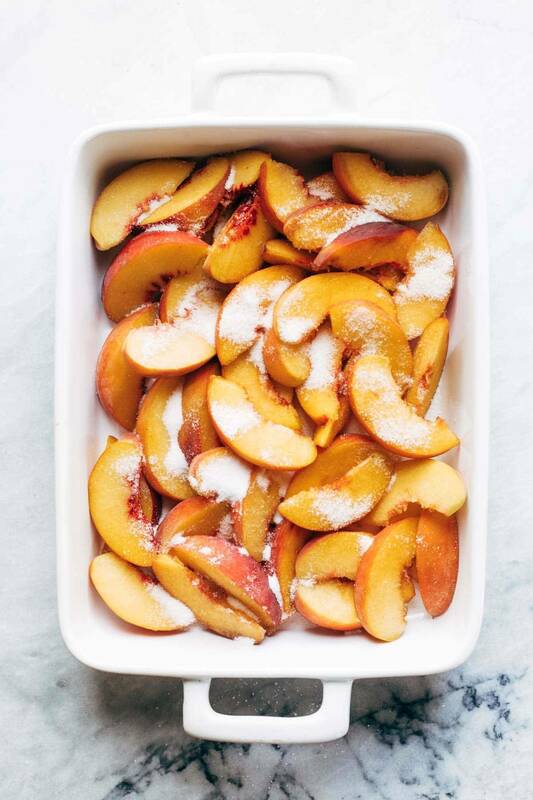 Thank goodness I stocked up on peaches this week at the store because they were 67 cents a pound… BECAUSE I AM MAKING THIS!!! Looks amazing, thank you Lindsay! Do you think this would work ok with gluten free flour? Thanks! Thank you for this !! we have some peaches that I was going to grill, but am going to make this tonight instead ! now that the weather cooled down. Loved the IG stories and thank you for the YT video link. I am crying ! FLAKY!! great summer peach recipe , I’m breaking my diet for it this weekend, thank you! This looks amazing! I will definitely be sharing this with my mom! So I don’t really buy peaches much. How do you know when they’re ripe and good to use for something like this? And do you think any other types of fruit would work? Look amazing!!! Could this be made with blackberries instead of peaches? This does look easy and super tasty. I don’t know how bad you can go wrong with these easy instructions. And look at those dang pictures! Looks so good! I actually wanted to know if you would recommend trying this recipe with other kinds of fruit. Your recipes are inspiring, especially for someone like me, who is in her senior years and learning to cook! I cannot wait to try this recipe. It looks delicious and completely doable! Thank you! Looks Amazing! I’d eat it for breakfast too! You had me at cobbler. I knew when I got this in my inbox this week that I had to make it right away. Picked up some fresh peaches from my local farmstand this afternoon and made it tonight. This truly is one of the tastiest cobblers I have ever had. I have been loving everything peach lately and this certainly didn’t disappoint. Can’t wait to try it with apples in the fall. Thanks for sharing!